As TechConnect readers know, every issue has a theme that focuses on timely topics, but for this issue, we wanted to do something a bit different. We decided to devote our pages to those centers of innovation where ideas born today will help shape our society for years to come. We’re talking about our public universities; the progress was evident in a recent report from the National Academy of Innovators Association. Two of our universities were named to the list of the Top 100 Worldwide Universities Granted U.S. Utility Patents 2017. Additionally, according to the Arizona Board of Regents, the universities’ commercialization efforts resulted in 501 U.S. patents being issued from 2013-2017, and there were 122 startup companies transacted during that same period. 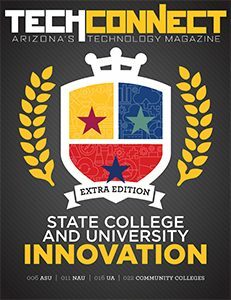 Learn more about recent innovations and accolades come out of our incredible state universities in the Fall 2018 TechConnect Magazine: State College and University Innovation. Access the full issue here.